This is an old farmhouse that has been restored with great care. 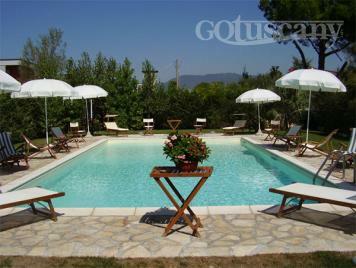 It is located in an ideal position: the town centre of Lucca is only 5 km away and if you take the highway – which is not far from the house – you can easily reach important art towns such as Florence, Pisa, Siena or the Versilia coast with its long sandy beaches and lively night life. The house (attached to other houses on one side) disposes of a big parking at the front and of a big entirely fenced garden (2000 sqm) on the back equipped with table (each apartment has its own table), chairs, beach umbrella, deckchairs and barbecue: this is the perfect place to sunbathe and to dine al fresco. 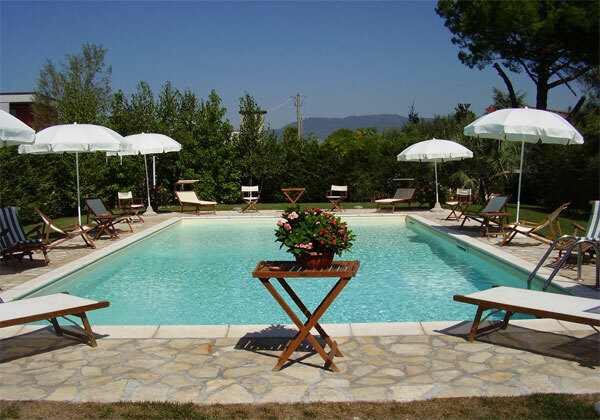 At guests' disposal there is also a swimming pool (set in earth 12x6 m, 80,150 cm deep) with salted water. All the apartments are furnished with taste, they are well-finished in every detail: the tapestry, the old pieces of furniture, the lamps matching the name of the property. There is a clothes dryer to be shared between all the apartments. Internet access is provided. Entrance through the veranda and through a glass door, hall with sofa, dryer to be shared with all the apartments, staircase to 1st floor, on the wall there is a huge painting representing the savannah, a lion and a butterfly. The apartment is on the 2nd floor. Entrance into the kitchen with stove/oven, microwave, fridge/freezer, table (extendable), 1 double bed settee, loft with 1 single bed, 1 double bedroom with wardrobe, two windows and loft (not to be used), 1 bathroom with shower, wc/bidet, small storeroom with washbasin and washing machine. Beamed ceilings, terracotta floors, in the kitchen one wall has visible stones, the other walls are in pastel colours. Air conditioning.